Cardinal Sean P. O’Malley is moving to sell six shuttered churches belonging to the Roman Catholic Archdiocese of Boston, removing the sacred standing of the church buildings through decrees made public today. The decrees satisfy a requirement under canon law that allows the archdiocese to pursue bids to sell the properties for redevelopment. In three of the churches, according to church officials, parishioners have maintained protest vigils since their parishes were shut down in the middle of the last decade, occupying the church buildings and holding their own lay services. A highly organized group of protesters at St. Frances Xavier Cabrini, in Scituate, for instance, has worked in shifts for years to maintain an around-the-clock presence. Two other closed churches, in Everett and Framingham, will live on as houses of worship, O’Malley has decided. For years, the fate of the closed churches has been the source of a dispute between local Catholic faithful and their archdiocese. Angry Catholics have fought the closings, taking their case to the highest authorities at the Vatican. The Vatican appeals were rejected last year. O’Malley, who had promised not to sell the buildings until the appeals to Rome were exhausted, is now asking vigil protesters to accept that it is finally time to move on. “He would ask the faithful to respect his decision, and in areas where there are vigils that there would be a peaceful conclusion,” said the Very Rev. Arthur M. Coyle, the cardinal’s liaison on the long process to prepare the churches for sale. A sign of the desperate times. Are These Ruins of Biblical City of David? Archaeologists in Israel have found remains which may be the biblical City of King David, the first evidence that the ancient Jewish empire actually existed. The bible refers to a powerful 10th century B.C. Kingdom of David, Israel’s second king, stretching from Egypt to the Euphrates, but little evidence of its existence has ever been found. Now, an archaeological discovery at Khirbet Qeiyafa, in Elah Valley, 30 km from Jerusalem, appears to show signs of a Jewish settlement. Professor Yosef Garfinkel, of the Hebrew University of Jerusalem, said that evidence found at the site included a single pottery fragment with an inscription believed to be an early form of Hebrew and olive pits dated as 3,000 years old. More here and a short news video. Father Benjamin Araujo Tavares, who is based in a remote area of the Amazon, said he began to receive anonymous threats in messages left on his mobile phone at the beginning of the month. He said one of the messages warned that he would be assassinated during Mass at Sao Pedro church in Boa Vista do Ramos, in the state of Amazonas. Father Tavares reported the messages to police but still conducted Mass three times last weekend, wearing a bulletproof vest and with security from Brazilian Military Police. “I was nervous but I found courage and with faith in God I made the celebration,” he said. According to reports in Brazil, police are now investigating whether the threats came from factions sympathetic to the local mayor, Elmir Lima Mota, an evangelical pastor. Father Tavares said the first threat against him was made on July 4, three days after he had participated in a demonstration against the mayor. He spoke out in favour of Mr Mota’s removal, saying people were suffering delays of two to three months in the payment of wages by the local council. Mr Mota said that wages were up to date, that any problems in the accounts were down to past administrations and that he had himself suffered threats. Father Tavares said that he had now changed his mobile phone number but had since received a further threat. Nearly three quarters of Brazil’s 191m population are Catholic, making it the world’s largest Catholic country. Let us pray for his protection! If you have trouble concentrating on the Holy Rosary, like I do, then this slide show can really help you out. For each of the fifteen mysteries of the Rosary there are ten slides, each with a picture and a meditation for that particular bead of the Holy Rosary. A painting which has been hanging in a student hall of residence at Oxford since the 1930s could be a Michelangelo masterpiece worth £100million. 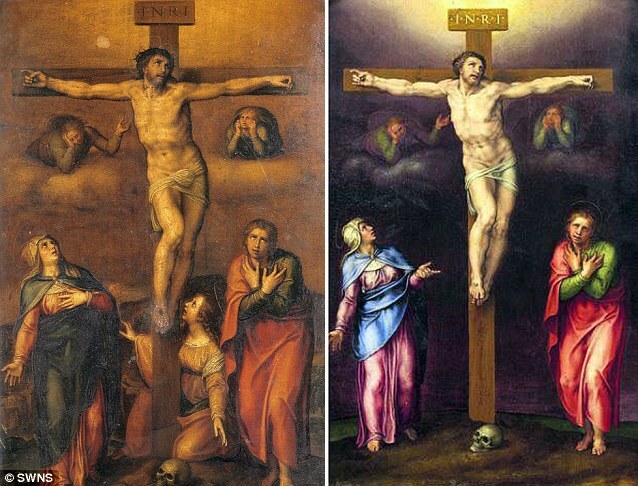 The mid-16th century work depicting the crucifixion of Jesus was believed to be by one of the Renaissance artist’s contemporaries, Marcello Venusti. But Italian scholar Antonio Forcellino claims that infra-red technology revealed the 12-inch by 27-inch work to have been painted by Michelangelo himself. ‘No one but Michelangelo could have painted such a masterpiece,’ Mr Forcellino wrote in his book The Lost Michelangelos. Only a handful of Michelangelo paintings exist which are confirmed as authentic, and all are in museums. If the one discovered at Oxford’s Campion Hall is authenticated and put on the market, it could beat the £70million record price for a work of art sold at auction set by a Picasso last year. Clare Dewey of Axa art insurance said: ‘To say Michelangelos don’t come on the market very often would be an understatement. A tiny drawing by the artist sells for millions, so that puts into context how much a painting would fetch if you could prove it is genuine. The painting, Crucifixion With The Madonna, St John and Two Mourning Angels, was bought by Campion Hall at Sotheby’s for an undisclosed sum in the 1930s. I’m afraid I don’t know enough about art to comment. Beijing — China’s government-backed Catholic church ordained a bishop without the pope’s approval on Thursday, overruling objections from the Holy See and an appeal to Chinese leaders. The ordination is Beijing’s third without a papal mandate in eight months, deepening a standoff between China and the Vatican over the Holy See’s insistence on the pope’s sole right to appoint bishops. Beijing’s communist rulers see it as foreign interference. The Rev. Joseph Huang Bingzhang “is now the bishop of Shantou. The ordination ceremony has finished,” Liu Bainian, honorary president of the Chinese Catholic Patriotic Association, the state-controlled group that runs China’s Catholic churches, told The Associated Press on Thursday afternoon. Vatican-affiliated news agency AsiaNews reported Wednesday that four bishops who had been held “for days” by government representatives would be forced to attend the ceremony in Shantou city in Guangdong province, along with four other bishops. Beijing places tremendous pressure on priests and lay people to go along with its choice of bishops. A papal adviser, Hong Kong Cardinal Joseph Zen, took out a half-page advertisement in Wednesday’s mass-market Apple Daily newspaper in Hong Kong to issue an “urgent appeal” to President Hu Jintao and Premier Wen Jiabao. The Vatican was furious over the ordinations of the Rev. Guo Jincai in Chengde city in November and the Rev. Paul Lei Shiyin in Sichuan province just two weeks ago. It does not recognize them as bishops. The head of Hong Kong’s Catholic church, Bishop John Tong, wrote a letter Wednesday to parishes in the diocese, reiterating that such ordinations are “illegitimate,” AsiaNews reported. Hong Kong and Macau are the only places in China where papal authority over the Roman Catholic Church is allowed. Why don’t the Priests elected (forced?) simply refuse to be Bishops, or flee? He seems to be a rather happy man. You can read more on his controversial election here. UPDATE: And, he’s gone. Excommunicated! Good.